This is a great recipe for any St. Patrick's Day celebration. 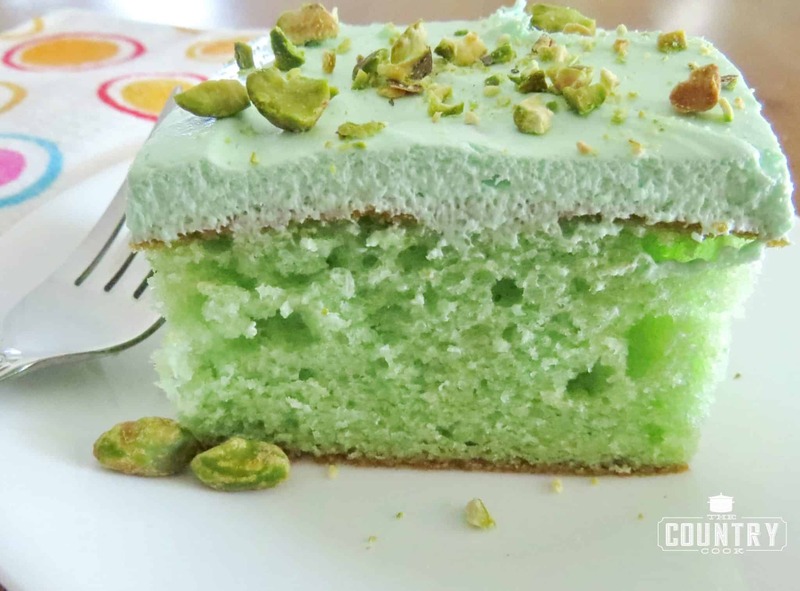 This easy Pistachio Cake recipe starts with a boxed cake mix and it is transformed into a super yummy cake that tastes homemade! In a medium bowl, combine dry cake mix with dry instant pistachio pudding. Mix those together until combined. Then add in eggs, oil and milk. Stir in about 6 to 8 drops of green food coloring until fully incorporated. If you insert a toothpick into it, it should come out clean when done. Allow cake to cool completely before making frosting. To make frosting, put instant pistachio pudding mix into a mixing bowl. Add in 1/2 cup cold milk. Now stir in your thawed whipped topping. Once again, I put in a few drops of green food coloring to really bring out that green color. About 5 drops or so. If you like, sprinkle with some crushed pistachios.